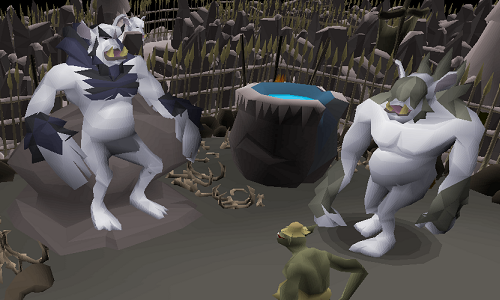 This week sees the release of Mod Ash’s troll quest sequel, Making Friends with My Arm as well as Deadman changes for the Autumn finals and Winter Season, and the official release date of OSRS Mobile. Today's new quest revisits some older lore. My Arm, the troll from My Arm's Big Adventure, must embark on another journey of discovery. This time you'll be escorting him to Weiss, a newly discovered troll town in the far north of the world, so he can share his wisdom *cough* with the inhabitants, in exchange for learning about their inventions. Life's journeys can take us to some strange places, but My Arm is about to face the greatest adventure of all - true love. Plus they'd like him to kill the Wise Old Man of Draynor Village, which doesn't sound like a clever move. Can you help My Arm get a grip on the situation and woo the fair Snowflake over the objections of her father, Mother? Or will My Arm be left to a loveless life of loneliness? The trolls won't let you start the quest unless your unboosted Firemaking level is adequate. The other three stat requirements are checked only where they're needed in the quest and accept stat-boosts. 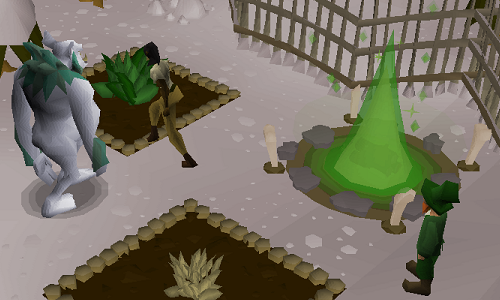 If you can support My Arm to a happy ending, the trolls will build you another disease-free herb patch, as well as teaching you advanced Firemaking techniques invented by the Weiss trolls, letting you create permanent fires in designated fire pit sites across RuneScape. Fire of Eternal Light - perpetual light shines to dispel the darkness of the Mole Hole, Lumbridge Swamp cave and Mos Le'Harmless horror cave. Fire of Nourishment - unlocks a new disease-free herb patch. Fire of Unseasonal Warmth - renders you permanently immune to the cold weather effects around the God Wars Dungeon. Also requires level 60 Construction. Fire of Dehumidification - prevents swamp damage and ghast attacks in the main areas of Mort Myre. Also requires level 50 Construction. Glowing Basalt teleport tablets can teleport you back to Weiss, and also to the Troll Stronghold for easier access to My Arm's original herb patches. You can build a Troll Stronghold portal in your player-owned house portal room too. The Deadman Autumn Finals kick off at 3pm BST on Saturday 8th September. The top players from the Autumn Season will spend the week preparing for the frenzy of the Permadeath stage, where they’ll be fighting for a share of the $32,000 prizemoney. The Autumn Finals culminates on 15th September. We’ll be broadcasting the action live from ESL in Leicester, set a reminder to watch the event on twitch or join us in person – there are just a handful of tickets left! Learn more about the Autumn finals. One notable change is the addition of the PvP sets. 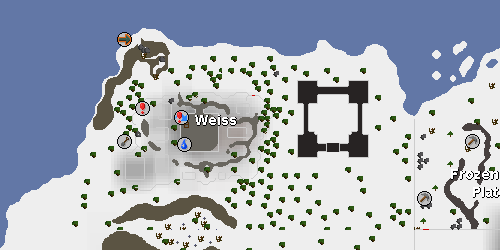 For the first time in Old School RuneScape you’ll be able to see Vesta’s, Statius’, Morrigan’s, and Zuriel’s! A big thanks to Mod West for his faithful recreation of the iconic sets. #OSRS Mobile: Coming October 30th! 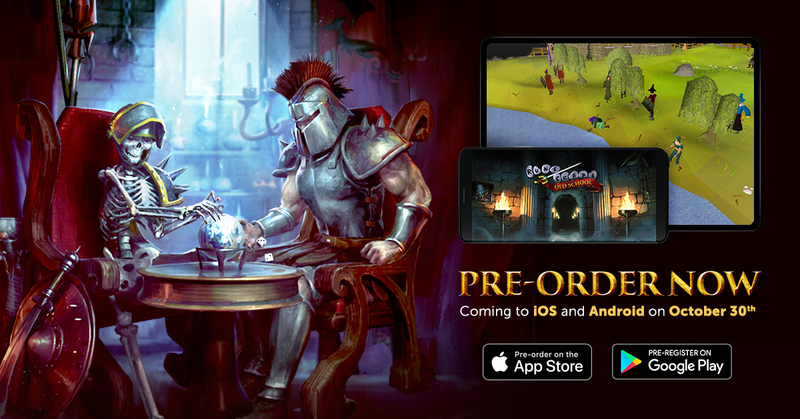 Yesterday we announced the official release date for the full launch of Old School Mobile! This will take place on October 30th. The mobile version of Old School RuneScape offers full cross-platform play with PC, meaning when you're out and about you can pick up from where you left off at home and is completely free! The full version will be open to free players and members alike. We’re delighted to announce that a new range of pins and keyrings from Angels Scapes is now available on the RuneScape store! The selection includes pin badges of draconic boss-monster Vorkath and one-hit menace Jad, along with keyrings depicting Chambers of Xeric’s Great Olm and Inferno boss Zuk. We’re also pleased to confirm that many popular Angels Scapes items are now back in stock, including the Armadyl and Saradomin Godsword and the Infernal Max Cape keyrings. An issue where players were unable to perform a special attack on a player in multi that had recently been hit by another player's special attack has been fixed. The Wilderness level information has been re-positioned to avoid overlapping interfaces on mobile. When interfaces such as the poll booth would overlap with tabs such as the inventory, the tabs are closed automatically by default but can be opened again. Mirrors are now correctly displayed when looking into them during the Desert Treasure quest on mobile. Spirit trees now use the correct chathead when attempting to travel to a location that you're already at. The drop rate for elite clues from Theatre of Blood has been adjusted. A grammar error in Kolodion's dialogue for Mage Arena II has been fixed. All functionality to sections of the chat box options have been restored. The configure filter can now once again be toggled. Auto-chat can once again be paused.